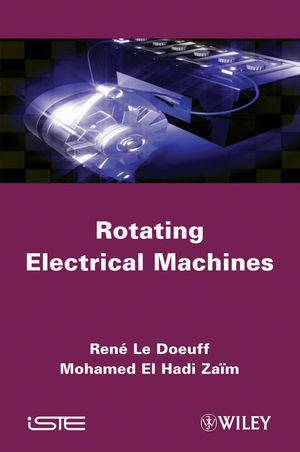 In this book a general matrix-based approach to modeling electrical machines is promulgated. The model uses instantaneous quantities for key variables and enables the user to easily take into account associations between rotating machines and static converters (such as in variable speed drives). General equations of electromechanical energy conversion are established early in the treatment of the topic and then applied to synchronous, induction and DC machines. The primary characteristics of these machines are established for steady state behavior as well as for variable speed scenarios. Important new applications for this technology (such as wind turbines, electric propulsion systems for large ships, etc.) are addressed and the book is illustrated with a large number of informative and detailed photographs, provided by various companies at the leading edge of research and applications in the field. René Le Doeuff is Emeritus Professor at the University of Nantes (France). Mohamed El Hadi Zaïm is Professor in the Department of Electrical Engineering of Polytech'Nantes in St Nazaire (France).